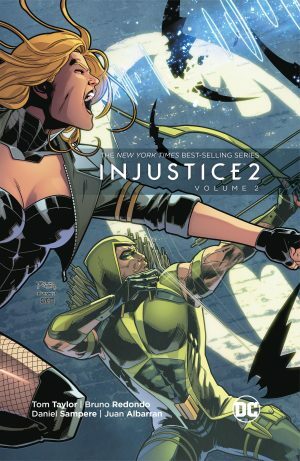 Five prequel stories leading to the world as seen in the Injustice video game were a surprise success, with the invention of Tom Taylor ranking his contributions above the remainder, so it’s pleasing to see him back at the helm for this sequel. Instead of categorising events by year, this is just an ongoing series of sequentially numbered books, and begins with a powerful scene of a captured Superman addressing Batman. 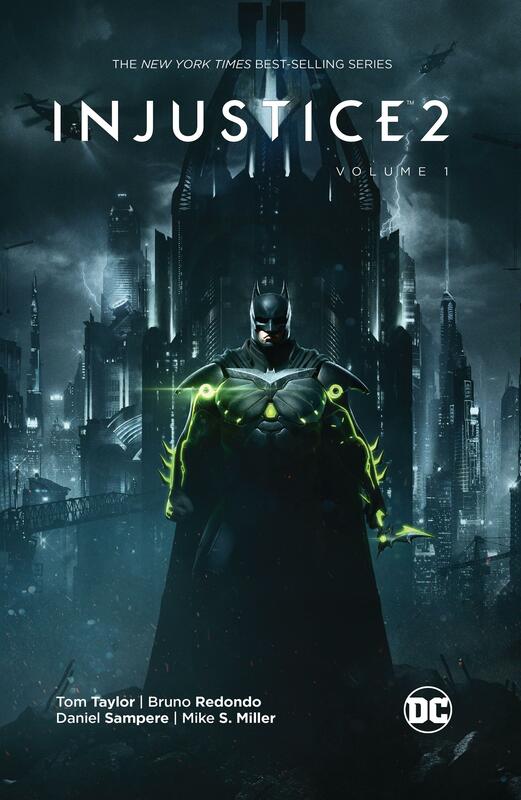 The purpose of the first Injustice game was to topple Superman’s regime, and the aim of the second is for Batman to restore order to a ravaged world. “Once you take the reins, you will never return the world to the people”, is how Superman addresses Batman. “You will always seek ultimate control. Because in the end you’re still just a scared child still trying to stop two bullets”. From a surprising source comes another piece of advice that Wayne “make a world where the night no longer needs a Batman”. That’s possibly easier said than done. Taylor employs the same writing style as previously, creating short scenes over a few pages at a time spotlighting assorted characters. He does this intelligently, evolving situations that seem natural, but which allow him to display who people are and what they can do. While returning some of the big players from his earlier Injustice stories, Taylor also introduces people we’ve not seen before, the Suicide Squad being one selection, and runs a mystery throughout. There’s also the bigger background idea of how the planet should be restored. Superman’s offered his thoughts on Batman’s capabilities, and there are others with opposing priorities. 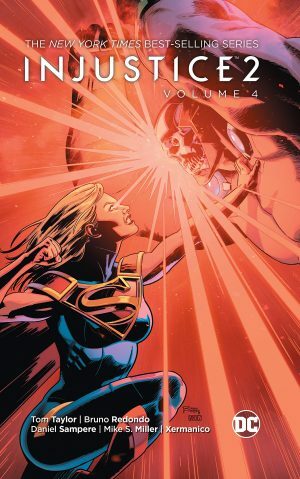 What made Taylor’s stories stand above in the previous Injustice series was the quality of the small problem solving moments, where Taylor introduced a seemingly impossible situation, then shortly after reveals how to close it down. He we have a fantastic use of the Atom, and of Booster Gold, and you’ll not believe the thrill provided for your inner ten year old as Batman collects his allies. Artistically we’re in safe hands, Bruno Redondo (sample art left) and Mike S. Miller are back on board, although Miller only draws a single chapter and won’t be back until volume three, and new boy Daniel Sampere (sample right) is fantastic. 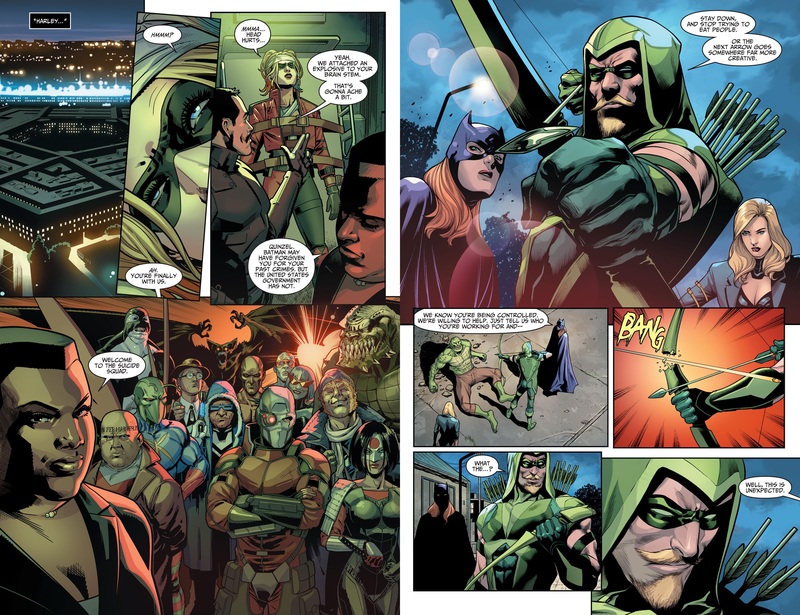 He matches Redondo’s lead well, with clear layouts, feature panels for effect and a nice line in facial expressions, needed for a great conversation between Black Canary and Green Arrow. Hang on, weren’t they spirited away to another dimension? Miller’s chapter is the finale, and a gem. 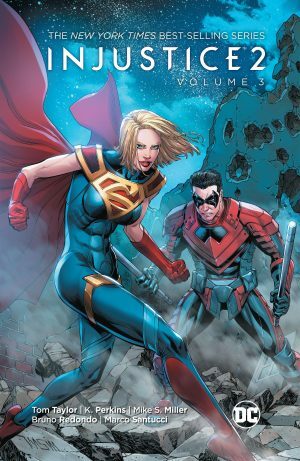 Wonder why we didn’t see Supergirl last time round? This explains why. In effect, her flight was delayed. Taylor introduces her now, and to some interesting company. The potential consequences are frightening, and just the foreshadowing needed to lead into volume two. There’s been a lot of hope, but also tragedy and indications that building a new world will come at a cost. It’s constantly thrilling superhero storytelling. Bring on volume two.